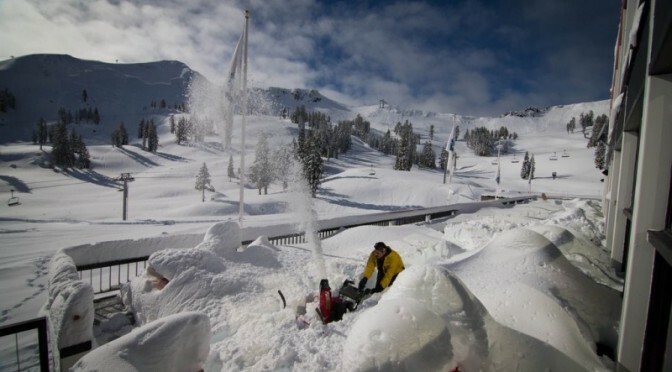 Mammoth Lakes, CA – After struggling through the first half of the winter with barely enough natural snowfall to stay open, ski resorts across the Sierra Nevada are now reveling in a five-day storm that left up to five feet of fresh snow on the mountainsides. After watching skier visits decline throughout the Christmas/New Year’s and Martin Luthur King Jr. holidays, the snow that fell late last week arrived just in time to redeem the all-important President’s Week holiday. At Mammoth Mountain, where three feet of new snow fell, summit base depths have now reached 70 inches and resort officials plan to have 100% of terrain open for skiing and riding by the weekend. Even more snow fell upon the summits of Tahoe resorts, although in many cases the rain/snow line inched up above the base areas of some of the region’s ski areas. 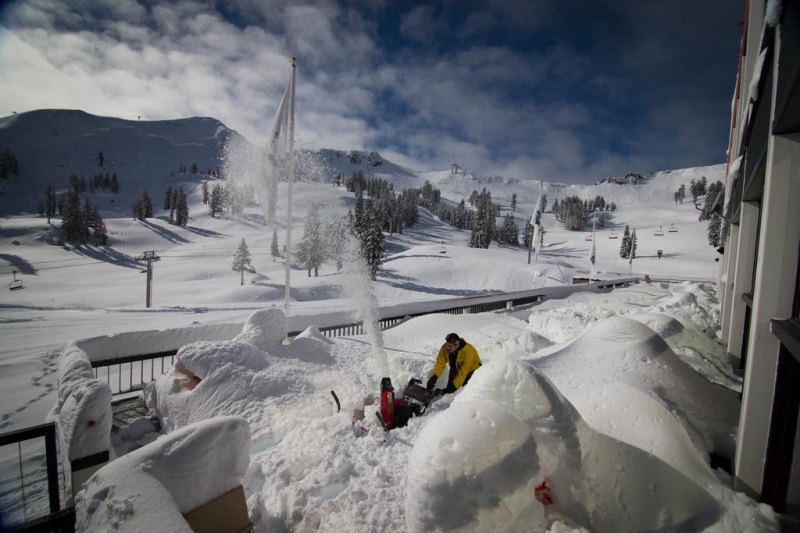 A reported 68 inches, or over 5 ½ feet of snow fell at Squaw Valley and 63 inches next door at Alpine Meadows. The new snow has added to base depths at both resorts and will allow both mountains to open new terrain this week. The two Lake Tahoe resorts were open on Monday with 15 lifts at Squaw Valley and seven at Alpine Meadows. New lifts slated to run this week for the first time this season include Solitude chairlift at Squaw Valley, and Scott chair and Lake View at Alpine Meadows. Siberia Express is also slated to reopen at Squaw Valley starting today. Across the lake at Heavenly, the weekend storm dumped over three feet of snow. Additional terrain is opening continuously at the South Shore resort, including guest favorites like Milky Way Bowl, Pinnacles and Upper Gunbarrel, with a total of 61 trails and 19 lifts. Thanks to Tahoe’s highest base elevation at 8,260 feet, Mt. Rose Ski Tahoe in Nevada received all snow from the weekend storm. Officials there report storm totals of 39 to 51 inches, accounting for nearly half the snowfall received by the resort season-to-date. At the height of the storm, however, the resort above Reno lost power, forcing lifts to remain closed on Saturday, ironically leaving many local powderhounds disappointed because of too much snowfall.